Copyright: © 2017 Ahmed MMA, et al. This is an open-access article distributed under the terms of the Creative Commons Attribution License, which permits unrestricted use, distribution, and reproduction in any medium, provided the original author and source are credited. Behcet’s disease (BD) is a multi-systemic chronic inflammatory disorder which is frequently seen in Mediterranean, Middle Eastern, and Far Eastern countries. It is characterized by recurrent oral aphthous ulcers, genital ulcers, uveitis, and skin lesions. Etiology of BD is uncertain, however, genetic predisposition (human leukocyte antigen-B51) is also thought to play a role. Vascular involvement which is encountered in 25-30% of patients is the leading cause of death . Involvement of arterial system is infrequent compared with venous system. Inflammation of vasa vasorum may cause aneurysm formation, most commonly in the abdominal aorta. Thoracic aorta and pulmonary arteries are rarely affected . Nevertheless, the most common cause of pulmonary artery aneurysm (PAA) is BD . Although vascular lesions are frequently encountered in this disease, cardiac involvement is rare and is a sign of poor prognosis . Cardiac involvement is among the most lifethreatening complications in BD. They include pericarditis, coronary artery stenosis or aneurysm, myocarditis, cardiomyopathy, congestive heart failure, valvular pathology, endocarditis, intra cardiac thrombosis, and aneurysm of aorta or its branches . A 50-year-old female patient presented to the cardio-clinic (NAFH) with dyspnea, non-typical chest pain, and palpitation. Physical examination was unremarkable. A complete blood count revealed leukocytosis (12.500 per mm3), and the erythrocyte sedimentation rate was 35 mm/h. Biochemical parameters were normal. The chest roentgenogram was normal. ECG was normal. A transthoracic echocardiographic examination revealed a right atrial thrombus. The thrombus was 18 × 11 mm in dimensions, attached to the IAS, and freely mobile (Figure 1). Figure 1: Transthoracic subcostal view showing right atrial free thrombus. A meticulous questioning regarding prior symptoms revealed that the patient had been suering from oral and genital ulceration for almost five years. With a positive pathergy test, the diagnosis of Behcet’s disease was established. No clinical features of venous thrombosis were detected. Screening tests for hypercoagulability included normal levels of protein C and protein S, and positive antiphospholipid antibodies. Anti-nuclear antibody (ANA) was negative. The patient was started on Warfarin (5 mg per day), oral azathioprine (2 mg/kg/day), and prednisone (1 mg/kg per day). The glucocorticoid dose was tapered gradually. She did well on follow-up, and a transthoracic echocardiographic examination at 2 months showed that the thrombus size was diminished (13 × 9 mm). At 8 months thrombus size was measured as 8 × 5 mm on transthoracic echocardiography. At one year, transthoracic echocardiography revealed that the thrombus had been completely dissolved, and the patient was free of symptoms (Figure 2). 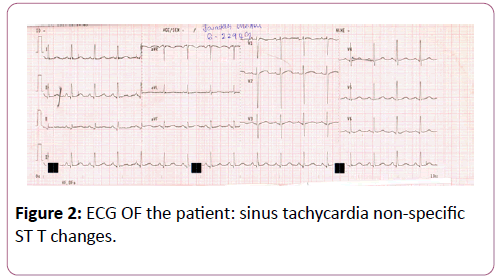 Figure 2: ECG OF the patient: sinus tachycardia non-specific ST T changes. Behcet’s disease is a chronic, multisystem disorder in which Vasculitis is the prominent pathological process . Hypercoagulability is associated with this disorder and the presence of anti-phospholipid antibodies is an independent predictive factor for increased risk of vascular thrombosis in individuals with Behcet’s disease [4,7]. Cardiovascular involvement has been reported to occur in about 1–7% of patients with Behcet’s disease. The reported complications include endomyocardial fibrosis in both the right and left ventricles, thrombus in the pulmonary artery or right ventricle [5,6]. Anti-phospholipid antibodies are reported to be present in patients with Behcet’s disease and are associated with increased risk of vascular thrombosis. The anti- phospholipid antibodies were positive in our patient, and this may have contributed to cardiac thrombus formation [4,7]. Cardiac thrombi may demand surgical treatment if they cause hemodynamic compromise or congestive heart failure, but recurrence after surgery has been reported . In our patient, surgical treatment was considered because the right atrial thrombus was large and it protruded into the tricuspid valve orifice. However, it did not cause hemodynamic compromise and congestive heart failure. Considering the excessive risk of recurrence after surgery, he was managed medically with immunosuppresses and anticoagulants. The result was extremely satisfactory, with gradual resolution of the thrombus and improvement of symptoms . Patients who are hemodynamically stable and who do not show signs of congestive heart failure can usually be managed with a conservative approach. Our patient had a large and free right atrial thrombus which protruded into the tricuspid valve orifice; nevertheless, she had no hemodynamic compromise or congestive heart failure. Considering the risks of surgical treatment and possibility of recurrence, we preferred a conservative approach which proved to be successful. Intracardiac thrombosis is generally one of the serious cardiac complications, and may be one of the first findings of the disease with pulmonary emboli, or may cause cerebral emboli by passing through the patent foramen ovale. Often, the right ventricle is involved, but it has been demonstrated that the left ventricle can also be involved [10-12]. The main cardiac features of BD include pericarditis, myocardial (diastolic and/or systolic) dysfunction, valvular, coronary (thrombosis, aneurysms, rupture), and intracardiac thrombus. Several cardiac manifestations may coincide in one patient. Cardiologists should always bear in mind the potential threats of symptomatic cardiovascular involvement in BD and consider diagnostic measures (echocardiography, CT, MRI) for its timely detection. The prognosis of cardiac lesions is poorer than that of lesions in others organs involved in BD, but anticoagulation, immunosuppressant agents, and colchicine seem to improve the prognosis of cardiac manifestations in BD . Ceylan N, Bayraktaroglu S, Erturk SM, Savas R, Alper H (2010) Pulmonary and vascular manifestations of Behcet disease: imaging findings. AJR Am J Roentgenol 194: 158-164. Park JH, Chung JW, Joh JH, Song SY, Shin SJ, et al. (2001) Aortic and arterial aneurysms in behçet disease: management with stent-grafts-initial experience. Radiology 220:745-750. CelenkC, Celenk P, Akan H, Basoglu A (1999) Pulmonary artery aneurysms due to Behçet's disease: MR imaging and digital subtraction angiography findings. AJR Am J Roentge172:844-845. Cemri M, Erkan A, OzdemirM,Cengel A (2002)Behcet’s Disease with a Large and Free Right Atrial Thrombus. Eur J Echocardiogrph 3: 233-235. OwliaMB,Mehrpoor G (2012)Behcet’s Disease:new concepts in cardiovascular involvements and future direction for treatment international scholarly research network. ISRN Pharma 12: 76-84. Erkan A (2016)Behcet’s disease: A comprehensive review with a focus on epidemiology, etiology and clinical features, and management of mucocutaneous lesions.Derma J 43: 620-632. Jennette JC, Falk RJ, Bacon PA (2012)Consensus nomenclature of Vasculitis. Arthritis Rheum 65: 1-11. OwliaMB, Mehrpoor G (2012)Behcet’s Disease: new concepts in cardiovascular involvements and future direction for treatment international scholarly research network. ISRN Pharmacol 5: 60-64. Cemri M, Erkan A, OzdemirM, Cengel (2002) A: Behcet’s Disease with a large and free right atrial thrombus.Eur J Echocardiogr 3: 23-27. Darie C, Knezinsky M, Demolombe-Rague S, Pinède L, Périnetti M (2005) Cardiac pseudotumor revealing Behcet's disease. Rev Med Interne 26:420-424. Fekih M, Fennira S, Ghodbane L, Zaouali RM (2004)Intracardiac thrombosis: Unusual complication of Behcet's disease. Tunis Med 82:785-790. Wechsler B, Du LT, Kieffer E (1999) Cardiovascular manifestations of Behcet's disease. Ann Med Interne 150:542-554. Selami D,Husnu D, Sinan I, ArifArisoy (2015) Cardiac manifestations in Behcet's disease. Eur J Echocardiogr 8: 25-27.